The latest exhibition opened on Thursday 14th September and will run until 21st October. Please note that during the Hailsham Festival of Arts & Culture the gallery will (in addition to normal opening times) be open on Sunday 17th and Monday 18th September. On Saturday 23rd September a Pop Up Cafe will be serving coffee/tea and homemade cakes form 10:30 – 12:30 and visitors will have an opportunity to chat informally with some of the exhibiting artists. In this new show two artists, Brenda Lowe and Lynn Inglis, exhibit a vibrant and diverse selection of paintings, exploring the use of colour. Their work has been influenced by the strong light and beauty of the Southern Mediterranean. As usual the gallery also has work by its group of resident artists and photographers. In addition to the hung work, all of which is for sale, there is a good selection of cards and prints. Here are the front and back sides of the flier for the current exhibition, which opens to the public Tuesday 31st July then continues till 9th September. 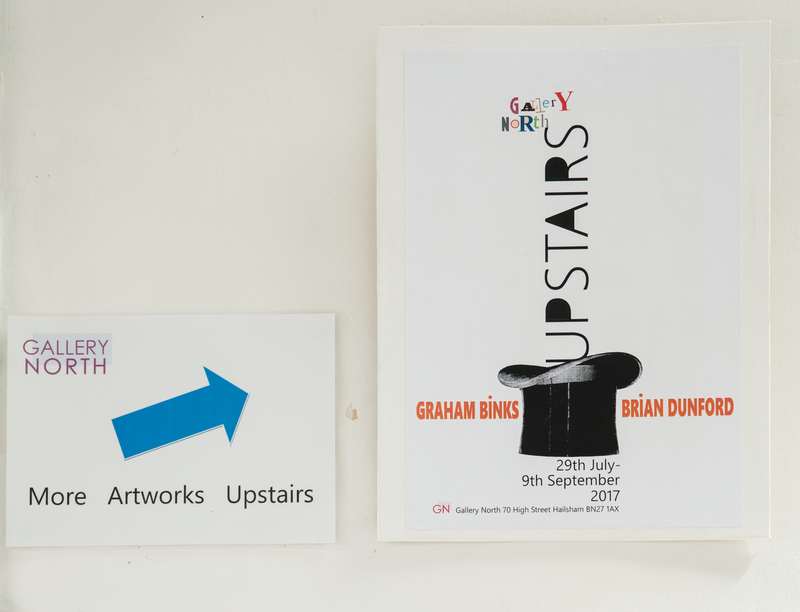 Incorporated into this exhibition is a special two-man show of work by Graham Binks and Brian Dunford, ‘UPSTAIRS’. There’s a lot of great work on show in this exhibition, including work by resident artists and photographers. A striking new exhibition of paintings and photography celebrating portraiture, identity and the figure is now on show till Saturday 22nd July. Featured artists: Nicola King, Lindy Dunbar, David Turner, Lorraine Harrison and Hugh Ford.